Concerned residents have pleaded with health chiefs to put an existing medical contract out for tender, in a desperate bid to save Harbottle Surgery. 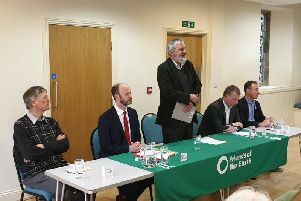 The impassioned call was made by villagers during a packed public meeting at Clennell Hall Farm on Tuesday night, following the shock closure of the facility last week. The well-attended forum heard that the surgery’s former GP practice holder, Dr Rina Miah, had decided not to continue with the current contract. In what has been described as exceptional circumstances, NHS England has encouraged residents to register with another GP practice in the short term, while alternatives for long-term service provision are being explored. This includes running some services from Harbottle in the future. But at the meeting, residents urged health bosses to put the contract out for tender to try to attract another GP, amid calls of ‘give us a chance’ from concerned locals. While Christine Keen, director of commissioning at NHS England (Cumbria and North East), didn’t completely rule this out, she felt that there were more sustainable options. She said: “We understand that there have been difficulties in delivering this contract in the past. We need to make sure that there are services in the immediate term, but also services in the long term, and making sure that this is sustainable. She added: “We are talking to local providers about how we can provide some services for the surgery in Harbottle. She added that discussions will also look at how services can be provided to serve patients in Upper Rede. During the meeting, residents pleaded for Dr Ian Brunt, whose contract was recently terminated by Dr Miah – according to a report by Healthwatch Northumberland – to be reinstated at the surgery. However, Dr Tim Butler, associate medical director for NHS England, refused to be drawn into that discussion, saying that he could not comment on Dr Brunt.